Before Christmas we were sent a couple of books from Barefoot Books and I purposely kept them back from Isla and Noah so that they would have something in the New Year. I love getting them new books (or as is the case with Noah, him discovering her old books, as he is at the moment, with her Julia Donaldson books) and this one is beautiful. It fits Isla to a tee. She loves princesses but I think she is an adventurer like Cinnamon Stitch. Cinnamon Stitch is the Princess in this book but she doesn't want to live by the stuffy Royal rules, she wants to have fun and be free. The trappings of royalty, fancy dresses and deportment aren't for Cinnamon Stitch so she sets to work to find freedom by making a kite to fly away. I'll let you find out what the King and Queen think of that, but what is great is that at the end of the book there are instructions for your little one to make their own kite! How cool! Something that I think Isla and I will definitely do one rainy Sunday. The Illustrations in this book are beautiful, what struck me is that it's so full of patterns and different shades of pinks and purples, all colours actually. It feels really magical and uplifting. The character of Cinnamon Stitch reminded me a lot of Pippi Longstocking (a favourite of mine! ), fun loving and a bit of a rule breaker. The book is written by Juliet-Clare Bell, herself a mother and she wrote it during kids nap times - I wish I could be so productive!! Accompanying the book is a CD of the story read by Imelda Staunton - we haven't actually listened to this yet as most of our CD listening occurs in the car and we can't get Noah off the Cbeebies album at the moment, but I think I'll burn it to the iPod and we can listen to it in the house. This book is becoming a favourite in our house, perhaps your little Princess might like it too? 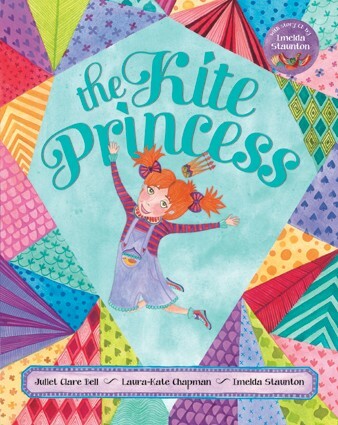 The Kite Princess is available from Barefoot Books from £6.99. Another Barefoot Book review coming soon. We were sent this book for free in exchange for a review - all opinions are my own.